Erica Lemieux has ingeniously incorporated all three of these elements into her urban agriculture business, City Seed Farms. 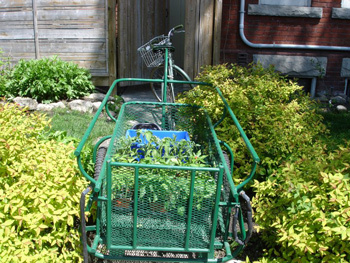 As the planting season begins, you’ll find her cycling between backyards in the High Park and Junction neighbourhoods of Toronto, with a trailer full of tools and seedlings. City Seed Farms is a far cry from John Deere and cash crops, and indicative of the entrepreneurial spirit that young farmers like Erica bring to growing food. In the interview below, Erica explains the purpose of her work and how it fits into the future of food production. 1) Tell us a bit about you. Where did you grow up? Did you ever imagine you would be a farmer? I grew up in Toronto. I gravitated toward High Park whenever possible and developed a curiosity about the natural environment. I gardened with my mother, took agriculture courses at McGill, and enjoyed visiting farms, but never imagined I would eventually spin farming into a career for myself. 2) When did you realize you had fallen in love with farming? I worked for an organic farmer in Kelowna, BC, two years ago. It was hard work. It took time and commitment, and there were many long days, rain or shine—you had to really love the job to pull it off properly. The farmer I worked for described his career in farming over the past three decades as an ongoing experiment. I think I fell in love with the perpetual challenge of it; getting better at growing food is a skill that doesn't ever plateau. 3) Please describe City Seed Farms. City Seed Farms is run by a core crew of three. We have plots of land in nine borrowed backyard spaces totaling about 1/4 acre, or 10,000 square feet. We use organic farming methods—no chemical fertilizers—to grow tomatoes, lettuce, arugula, kale, beets, carrots, bok choy, and all sorts of delicious leafy greens. Manure, worm castings, and a mix of organic soil amendments, like alfalfa and kelp meal, are used to enrich the soil, and we have on-site composting at each backyard site as well. City Seed Farm sells produce at the Sorauren and Junction farmers’ markets. This year, we will be supplying West End restaurants, too—Cowbell, Zocalo, Union, and Keriwa, to name a few. 4) What do you think are the most promising aspects of urban farming? Urban spaces are becoming more and more multi-use as people migrate into cities. Whether it is getting creative with energy consumption, recreation, or transportation, people are coming up with interesting and sustainable ways to integrate activities in city spaces. Urban farming is at the core of that new economy. Urban farming also overcomes a couple of barriers: particularly, the cost of land and access to markets. I exchange a weekly basket of produce for the entire growing season for use of people's backyard spaces. The fact that I could start up my operations without a huge initial investment in land and with the ability to sell directly to consumers was due to the unique situation that urban and peri-urban farming provides. 5) What does urban agriculture mean for future generations? Young farmers are crucial for the future of food in Ontario and Canada. The average age of farmers in Ontario is 57. We desperately need to lower that average. There is more opportunity than ever for young people to take back control of their food system. I have found the journey into producing food to be fully supported by my community, including rural producers. I’ve also come to realize that everyone generally recognizes this as a positive direction for urban communities. As well, the capacity to grow food in Toronto (in yards and on rooftops) is far, far larger than the current level of use. Toronto also sits atop some of the best agricultural land in the world. You can see over a third of Canada's Class 1 farmland from the CN tower. That means it’s literally in our backyards! Farming takes hard physical work, commitment, and passion. 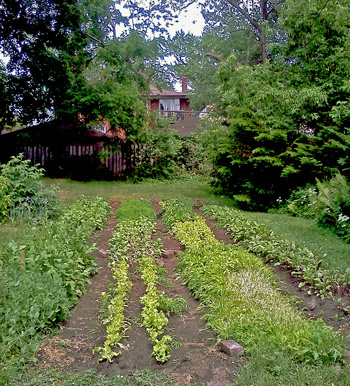 I'm excited to see urban agriculture in Toronto continue to burgeon forth, as it has been for the past few years.